"A proud couple’s bundle of joy is really a newborn terror in filmmaker Larry Cohen’s cautionary original It’s Alive that tapped into environmental fears. The horror grows when multiple child monsters rampage in the first sequel It Lives Again as two brave parents try to stop them by becoming the bait for their spree. The now global mutants are rounded up and relocated to a far-flung island in It’s Alive III: Island of the Alive. Will a parent’s greatest nightmare become the world’s gravest fear? Find out … if you dare. Extras are in progress and will be announced at a later date. The art you see showcased (illustrated by Joel Robinson) will be on the slipcase. Although we can’t show you them yet, the plan is to have the original theatrical key art for each of the films on the three separate blu-ray cases that will be inside of the case. We’ll share those later as well." Erick H., Matt89 and Angelman like this. Already covered in Page 427. Anyway, if this means Warner is finally cracking open their vaults to Warner, I'm hoping for Cats Don't Dance and the Censored 11/Banned Cartoons they refuse to release. Gotcha. Missed it since it was hidden inside a quote. Happy to report I found Misery today at Walmart came with slip for only 12.96. You can always find misery at Wal-mart. Just kidding... I love my local Wal-marts but since I worked for them I can bust their chops. Was a Wal-Martian for many years. National street date is March 27th but if you order from our site directly @https://www.shoutfactory.com/…/behind-the-mask-the-rise-of-… you'll get it two weeks early plus receive a limited-edition 18" x 24" poster of the newly-commissioned art (while supplies last!). Nailwraps and fceurich39 like this. We are pleased to announce that we have two new IFC Midnight films planned for release on Blu-ray & DVD this May! KALEIDOSCOPE – This intense, twisty thriller unfolds in the darkest corners of a man's mind. Recently released from prison, mild-mannered Carl (Toby Jones, Captain America: The Winter Soldier) quietly attempts to move on with his life. Just as he embarks on his first date in 15 years, Carl's fresh start is shattered by the sudden reappearance of his domineering mother (Anne Reid), whose presence awakens within him a deep-seated trauma. What unfolds is a brain-warping puzzle as reality and illusion, past and present collide and explode in violence. The debut feature from Rupert Jones is a provocative psychological mystery that asks: is it possible to escape our past? DESOLATION – Following her husband's death, grieving widow Abby (Jaimi Paige) journeys into the forest he loved to scatter his ashes, accompanied by her teenaged son (Toby Nichols) and her best friend Jen (Alyshia Ochse). As they wander the wilderness and reminisce, they're struck by a rising feeling of dread: they are not alone. A mysterious, silent stranger in sunglasses — The Hiker — is stalking their every move. Suddenly, they find themselves the hunted prey in a deranged killer's terrifying game. The nerve-shredding feature debut from Sam Patton will make you think twice before venturing into the woods. Any opinions on Eye Of The Cat or Games? I'm tempted by both, but have so much to buy. I dug Curtis Harrington's other fare from the time (The Killing Kind, Whoever Slew Auntie Roo?, What's The Matter With Helen?, etc). Haven't seen Eye of the Cat but I recall Games being a lot of fun. If you enjoy Harrington's other releases from the era I imagine you'd like Games as well. Already posted in this thread back on the 6th. Berlin and Los Angeles – February 15, 2018 – Shout! Studios, the multi-platform filmed entertainment distribution and production arm of Shout! Factory, has acquired U.S. rights to writers/directors Jen Soska and Sylvia Soska’s new feature remake of David Cronenberg’s early horror classic RABID. This multi-year agreement provides Shout! Studios with digital, on-demand, broadcast, home entertainment, and select SVOD rights to the RABID feature remake for cross-platform releases in the U.S. Back 40 Pictures will handle the theatrical distribution duties. The RABID feature remake by Jen and Sylvia Soska is being developed and produced by Back 40 Pictures in conjunction with Telefilm Canada and Ontario Media Development Corporation. The announcement was made today by Jordan Fields, Vice President of Acquisitions at Shout! Studios, and film producer Michael Walker. Jen and Sylvia Soska will direct this new feature from a screenplay they adapted with John Serge from the original Cronenberg classic. Michael Walker, Paul Lalonde, and John Vidette are serving as producers. Shout! Studios will be working closely with filmmakers and producers in the production process. The RABID feature remake is currently in the pre-production phase. Principal photography is expected to begin in April. “Remaking one of the seminal films of David Cronenberg’s early work is audacious, exciting and not a little nerve-wracking. But there are no better hands in which to place this challenge than the four belonging to the enormously talented Soska sisters. Their creative vision will both honor the Cronenberg ethos and find in Rabid a currency that will terrify today’s audiences,” said Jordan Fields, Vice President of Acquisitions at Shout! Studios. "It's a tremendous honor to be re-imaging David's 1977 body horror classic, RABID, with such incredible support behind us. We are not fans of soulless remakes as seems to be the trend these days as they disrespect the fans and the original body of work. Our RABID is a continuation of the thoughts and conversation David started with his original piece and modernized through a female perspective. This film will truly honor not only the original but Cronenberg's entire body of work which would not have been possible without a team behind us that cares about the artist and well as the fans. Shout Studios has always put the fans first and this film will blow audiences away with its authenticity and elevated horror," said filmmakers Jen Soska and Sylvia Soska. The film deal was negotiated by Shout’s Jordan Fields and Vanessa Keiko Flanders, and by Michael Walker on behalf of Back 40 Pictures and Clay Epstein of Film Mode Entertainment. Shout! Studios is the filmed entertainment production and distribution arm of Shout! Factory, specializing in all aspects of distribution, including theatrical, VOD, digital, and broadcast. Reflecting Shout! Factory’s ongoing commitment to innovation and excellence, Shout! Studios champions and supports like-minded filmmakers and creators at the forefront of pop culture, driving creative expression and diversity in independent storytelling. Shout! Studios finances, produces, acquires and distributes an eclectic slate of movies, award-winning animated features, specialty films and series from rising and established talent, filmmakers and producers." russweiss, Mutilated Prey, Matt89 and 1 other person like this. I’m also very curious to see what comes of this deal Shout has made with Warner. If they can somehow get Poltergeist and release it in a collector’s edition I’ll die a happy man. Myron Breck, wago70 and Nailwraps like this. Got mine yesterday actually! I bought it direct from Scream Factory & they shipped it out early. How is Dance Macabre both film and bluray? I think it was originally supposed to be the sequel to the 1989 Robert England Phantom of the Opera! 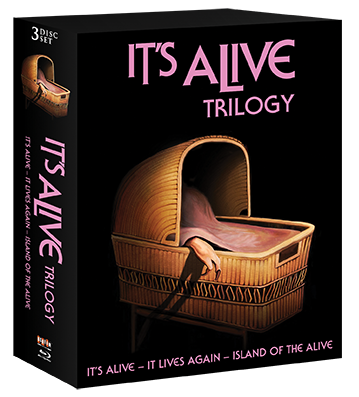 The It's Alive box set is $33.06 at Wal-Mart and Amazon.